Formulation: Blackthorn blossoms, birch leaves and St. John’s wort are combined with sunflower oil then carefully blended using unique rhythmic processing methods to allow the properties of the nurturing plants to be transferred to the oil. This oil is great to put on skin after night bath or shower before going to bed. Wrap up in a soft robe after and it warms and toned your skin and crawl into bed. You wake up with your skin feeling moist and taught. Fabulous! Heavenly. I’ve used all of the body oils and this is a favorite. I was a bit skeptical about the concept of this product, but the sample packets (received with every purchase) lured me in - purely based on the smell. I am hyper-sensitive to odors. Everything I use it unscented, but the scent of this oil intoxicates - oh and by the way -it is also effective. I apply right after a shower. I can't speak to the "toning" powers, because I'm fairly tone to begin with, but the silky softness of your skin well after application - AND the scent, well, it's enough to make me a fan! 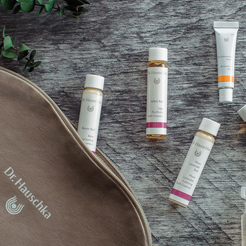 Thank you Dr. Hauschka and team! This is my first time purchasing the Blackthorn Toning Body Oil and I was wondering what it was going to smell like. That would be super important, turns out it's a rich, wonderful smell and the oil is so great for my skin. This exceeded my hopes and expectations and it has a unexpectedly nice scent as well! My absolute favorite body care product ever. Best after bathing or showering. Gives me the feeling of a warm embrace. I love the smell of this body oil. My skin is normally very dry and flaky and this oil leaves my skin feeling so good and sooo soft! Excellent oil for my skin. Keeps me feeling hydrated without any issues. Absorbs well and smells great. Highly recommend. With the arnica one I knew it was working on my bruises and aches, I can't tell if this one does anything but I really like it, I am partial to body oils though. This oil tones and warms the body. It is wonderfully soothing to the legs, applied from hips to toes, during prolonged sittings at the computer. Good for wintry days, as well. I haven't been using this long enough to see major skin changes, but so far I like it. I absorbs quickly and it's too oily. I gave 4 stars only because the smell isn't amazing. The product is excellent keeps my skin smooth. This product is an amazing oil. For a toning massage that helps to keep your skin elastic, smooth a small amount of Blackthorn Body Oil over the skin then grasp the skin between your thumb and index finger, pulling it gently upwards before releasing. Repeat five times before moving onto the next area of skin.